A couple of weeks ago, I saw a link to a story on CNN.com that discussed the abysmal literacy rates for college athletes in both public and private universities. Many student-athletes scored in the 200s and 300s on the SAT critical reading test — a threshold that experts told us was an elementary reading level and too low for college classes. The lowest score possible on that part of the SAT is 200, and the national average is 500. “It is in many ways immoral for the university to even admit that student,” said Dr. Richard M. Southall, director of the College Sport Research Institute and a professor at the University of South Carolina. Adults were categorized as having Below Basic, Basic, Intermediate, or Proficient literacy skills. Below Basicindicates no more than the most simple and concrete literacy skills. Basic indicates skills necessary to perform simple and everyday literacy activities. Intermediate indicates skills necessary to perform moderately challenging literacy activities. Proficient indicates skills necessary to perform more complex and challenging literacy activities. Please refer to Table 1 in A First Look at the Literacy of America’s Adults in the 21st Century for more detailed information. There’s a lot said about improving education in America, and growing numbers of parents are taking their children’s education into their own hands by homeschooling them, or even moving them into private schools. Charter schools, for all their success, are so limited that lotteries are held to determine the lucky few who will make it into the programs. With a good family behind the kids, they stand a chance to brave the system and get an education. But what about all the kids without a good family? What about the kids who are growing up without a father figure? Nearly 3/4 of black children are born to single mothers. Overall, the illegitimacy rate in America is over 40%. That’s nearly half of the children in this country STARTING at a disadvantage, born to single mothers, born without a male role model in their lives. 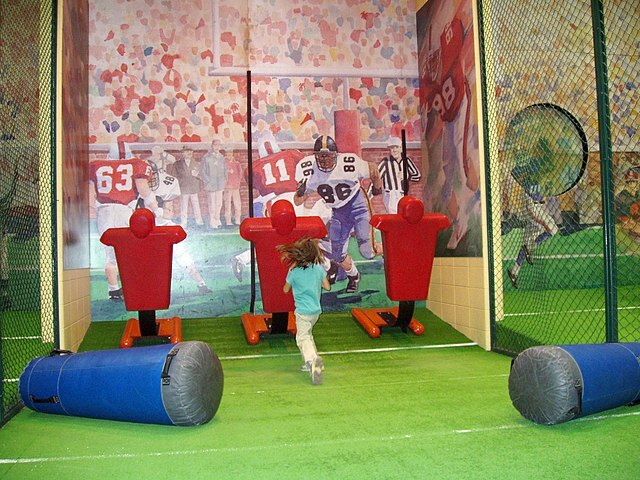 Blocking activity cage in the College Football Hall of Fame in South Bend, Indiana. When kids don’t have role models in the home, they look outside the home. With the ease of access to entertainment and sports, a lot of kids look to big sports stars and movie stars. They see these highly-paid positions – which are few and far between – as their ticket out of where they are. Children in a single parent home probably see a hard-working parent who gets nowhere in life. They see plenty of effort, but little-to-no payoff for working hard at school and getting a job. After all, what kind of payoff is there for working hard at the job Mom has? A sports scholarship isn’t even viewed as a way to get an education to get out of these low-paying options any more. Now, it’s seen as a ticket to the NFL or the NBA. The only problem is, there are far more college athletes than there are NFL and NBA positions. Professional sports is a tiny field, with incredibly high standards. And yet we have top-tier colleges allowing athletes to be admitted even when they shouldn’t even be let out of high school with such a lack of education. College sports are huge moneymakers; and yet the more this beast is fed, the more money it seems to demand, what with these multi-million dollar contracts for NCAA coaches and huge stadiums being built. And to keep this cash cow going, colleges seem willing to do anything to have top athletes play for them, education be damned. Colleges are perpetuating the illiteracy problem in this country by not demanding that their student athletes are all college-material. 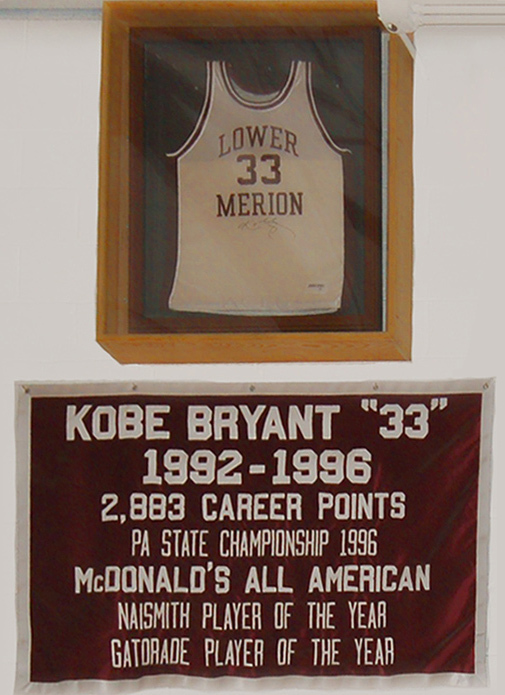 The more they lower expectations for their athletes, the more high school kids will meet those expectations by failing to study, while forever dreaming that they, too, can be the next Kobe Bryant. The next generation deserves better. We ought to demand that our alma maters hold athletes – all of them – to the same academic standards as the rest of the student body. If our kids are going to shoot for a professional sports career, they ought to have something to fall back on, and that college education they’re supposed to get while playing for top-tier schools ought to provide it. As long as colleges and universities continue to treat athletes as if they can’t do the work – and then excusing them from it – we’ll continue to have kids who don’t see the point of excelling academically. As long as they can play a sport well enough to get on a college team, that’s all they’ll care about. ← New Moon on Monday! New App Review on Tuesday! It has to start on a lower level than college. I’ve tutored way too many high-school students who weren’t reading above a 5th-grade level. High schools are part of the problem, because they don’t make and enforce the academic demands. Kids who can’t read shouldn’t graduate, let alone move on to college. I think in some ways, colleges have done this to high schools. Absolutely, kids shouldn’t graduate without the skills, but if colleges weren’t admitting athletes regardless of whether or not they could read, do you think more kids would try to gain the skills? Of course, much of this really comes down to families, which are increasingly crumbling to the detriment of our children. If we weren’t so Hell-bent on redefining marriage and families, more children would grow up in a secure setting with their parents. 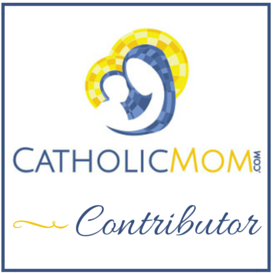 And, as you well know, at the root of the rotten state of families is the widespread use of contraceptives. Sadly, Pope Paul VI was right. What a state we find ourselves in these days.